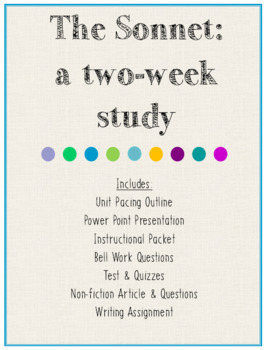 This unit plan contains 60 pages of materials (including answer keys) plus a 27-slide introductory Power Point presentation. 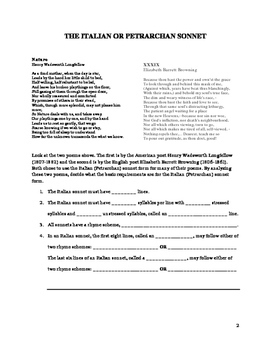 Specific materials included: a two-week lesson outline, an introductory Power Point presentation, a non-fiction background text (1150 Lexile®) with text-based questions, a 16-page instructional packet (student and teacher version), bell work questions for each day, two quizzes, and a two-part final test. This unit was written for a 9th grade accelerated ELA class, but the lessons and pacing can be modified to accommodate courses at other levels. 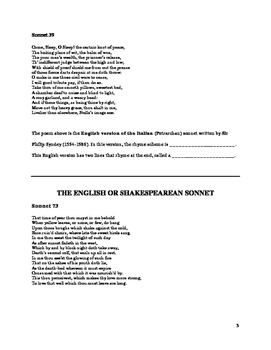 Emphasis is placed on the Shakespearean sonnet as this unit prefaces the reading of a Shakespearean play. 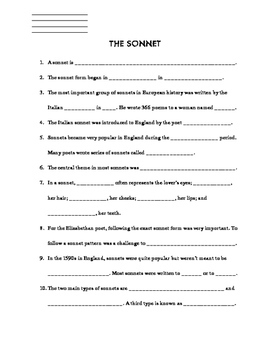 However, it also covers the Italian (Petrarchan), Spenserian, and the English version of the Italian sonnets.